The Muslim Uyghurs are an ethnic minority in Xinjiang, the most western province of China. 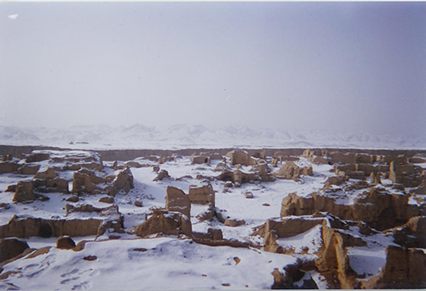 Particularly since the Communist takeover of the region in 1949, the Uyghurs have experienced religious and cultural persecution by the Han Chinese. With the discovery of oil and other natural resources in the region, the Han Chinese are now flooding into the region in an effort to exploit the resources. This influx of people has intensified the already tenuous relationship between the Han Chinese and the Uyghurs over their religious, cultural and social differences. Furthermore, the influx of people has lead to not only the extraction of resources but the over-cultivation of land and over-use of precious water resources in the area. As a result, the Uyghurs have strengthened their own campaign, sometimes resorting to violence, in an effort to reclaim their land to halt the religious and political persecution and, in extremist cases, to establish their own, independent Uyghur state. Along with cultural and political repression, the fight for oil is contributing to the repression of economic progress in the region as well. In order to understand the importance or the magnitude of the struggle for resources, it is important to understand the political and cultural struggles that have come before. The environmental aspect of the struggle between the Uyghurs and the Han Chinese is not only a cause of recent conflict but is also a contributing factor in the ongoing conflict which has existed for many years. The conflict in Western China is also unique in that the environmental aspect, as said before, exists both in the natural resources at stake and in the strategic geographic location of the region. The growing importance of its geographical position (it is important to note) is related to the development of neighboring nations and economies within the region. The development of the Central Asian states and the sympathetic Uyghur populations located within those states may prove to be a problem for Chinese control as they may encourage or even assist in the drive for an independent Uyghur nation in the future. Throughout various periods in history, the Uyghurs have experienced tastes of independence, the independent republic of East Turkistan, for a short time. However the Han insist that the same area was in fact settled by the Chinese over 2,000 years ago. As a result of the historical disparities, disagreements and hostilities over economic, political and cultural issues have plagued the region up through its modern history. As transportation and communication abilities increased, barriers to integration deteriorated. Furthermore, as the Soviet Union began to make agreements with warlords in Xinjiang to exploit the area’s natural resources, the Chinese government realized they needed to manipulate the geographical situation to favor their own interests. To take away trade routes from the Soviet Union, the city of Urumqi was made a transportation hub and the Han have been pouring into the region in search of agricultural and economic opportunities since. Ethnic friction has continued to intensify as more and more Han move into the region usurping Uyghur autonomy. Oil exploration officially began in 1951 with the drilling of the first well in 1955. Coincidentally, the first major incident of resistance occurred in 1954, the Khotan rising in Southern Xinjiang. In 1962 a mass exodus of Kazakhs and others westward was the result of a rationing of resources (specifically the grain rationing system). Han Chinese immigration and competition resulted in scarcities of agricultural land, water and pastures. Uyghur opposition grew increasingly more overt and nationalistic throughout the 1980s as the repressive atmosphere of the Cultural Revolution (1966-1977) began to wither (Rudelson, Oasis Identities). Chinese security officials acted with force to suppress what had been a peaceful pro-independence demonstration in Yining (a small city about 30 miles from the China-Kazakhstan border). Uyghurs contend that the Han Chinese were simply looking to exploit Xinjiang’s natural resources. Two days of riots followed. Though reports differ, it is believed that at least nine people were killed and hundreds more were injured. One month after this outbreak of violence separatists responded by detonating bombs on two public buses in Urumqi. By January, 2000 China had launched the “Go West” policy indicating that there is more at stake than merely increasing growth in Western China. Not only are there interests in Xinjiang for its natural resources but also, by extracting the natural resources from the area as an economic commodity, they (China) are in a sense taking away Uyghur livelihood and their (Uyghur) means to live. This results in two situations: first, the Uyghurs are left to flounder in a ‘backwards’ society, isolated from the rest of the world with no means to overcome the geographical and economic factors separating them. Secondly, as they are further marginalized, the Uyghurs naturally become increasingly discontent and perhaps leads to an increase in separatist/extremists mentalities. End: Present As China’s interest in developing strategic relationships with central Asian states continues (evidence in the development of the Shanghai Cooperation Organization: China, Russia, Kazakhstan, Kyrgystan, Tajikistan and Uzbekistan.) the region of Xinjiang will continue to be important both as a border region (for security measures) and as a viable source of energy. Over the last half of the 20th century several violent incidents have occurred. 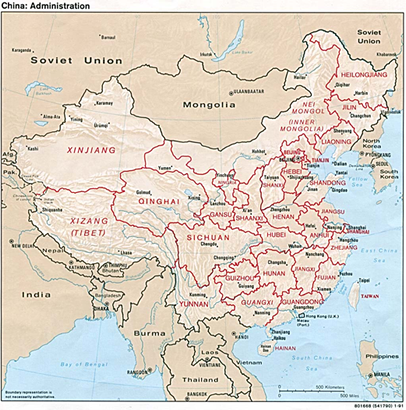 In the late 1990s and particularly in the aftermath of September 11th, the boundaries of the ethnic conflict and natural resources have grown beyond Urumqi, Xinjiang and the violence has now spread to cities like Beijing where deadly bombings were carried out in late 1997 (Dillon, 100). The Uyghur conflict has also spread internationally. For example, in October 2002, China’s Deputy Prime Minister claimed the U.S. government detained at least 12 Uyghurs at Guatanamo Bay for possible connections with terrorist networks. Though any terrorist connections have yet to be proven, if the Uyghurs are returned to China they will almost certainly face brutal interrogations and incarceration regardless. While the U.S. State Department has issued reports condemning China for its harsh treatment of accused separatists, they have also praised China on joining the West in the war on terrorism (Starr). The increasingly vocal Chinese dissidents or separatists (i.e. Uyghurs) may hurt China’s economic relationships as well. For example, Kazakhstan’s president has stated his opposition to any organization advocating separatism in China using Kazakh territory. China’s economic relationships, with neighboring nations, depends on China’s ability to reign in the ‘wild west of China’ and maintain control over the ‘violent separatists’. Western China: Xinjiang Province, and the Central Asian States: Russia, Kazakhstan, Kyrgystan, Tajikistan and Uzbekistan. The actual conflict has occurred in (what is considered) China, although scuffles have broken out near or on the Western border mainly with Kazakhstan but also Kyrgystan and Tajikistan as well. Also, it is important to remember that in discussing the connection between Chinese economic interests and the war on terror, Afghanistan does share a small border with Western China. Non-Sovereign Actors: Uyghur people (of Turkic Muslim descent) While the Chinese claim the Uyghurs are part of China, the Uyghurs consider themselves a separate national identity. Looking at direct causal linkages, the environmental conflict present alongside the ethnic conflict taking place in Xinjiang is a problem of source. The negative impacts of the repeated and invasive search for oil are only compounded by the fact that the benefits the area could potentially hope to see are lost as the oil is taken out of the region and devoted to development of eastern China. What makes the sacrifice of ethnic culture, language and political autonomy in the pursuit of economic development seem perhaps more in vain is the fact that China, with 9% economic growth yearly and the world’s second largest consumer of oil, China has also continued to develop oil projects outside its national borders in order to satisfy a need which may increase by as much as 7% this year over last(1). When 40% of China’s oil comes from imports and China is making deals to develop oil fields in Iran, why has the region of Xinjiang been so exploited when, according to some analysts, the actual amount of oil in the area is far less than originally claimed, and far less than could be found else where? According to the list of potential source problems, this case study could be placed under habitat loss for the simple reason that the extracting of oil is compromising or even destroying the Uyghurs’ livelihood and essentially their living conditions. Beyond that, however, if given the choice, I would categorize this study simple as ‘oil’. That simple term encompasses not only the desire for oil but also the side effects that come with it. In China, economic growth is at the forefront of most policy decisions and as such, the search for oil, a driving force behind economic growth, is placed above environmental concerns or implementation of environmental protections. The oil that is exploited from the region serves to fuel environmental degradation in other, more developed, parts of China. (1)China-Iran Energy Talks Complicate Nuclear Standoff. The Wall Street Journal. February 17, 2006. Xinjiang is a remote province and sparsely populated. It is made up of vast deserts which contribute to a climate of very cold winters and very hot summers. It’s an area of low humidity with more consistent patterns of rain as opposed to a concentrated rainy season. The Act and Harm sites are primarily the same: China. However, there have been a few exceptions as to the locations in China. 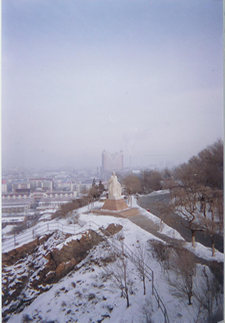 In early 1997, following the uprising in Yining (i.e. Gulja) in Xinjiang province (as mentioned above) there have been several bombs detonated on buses in Beijing, reportedly an act carried out by Uyghur Muslim separatists. (Though authorities originally denied the act as that of ethnic separatists, their actions proved otherwise, they began to carry out such orders as restricting religious worship activities (MacKinnon).) Perhaps this indicates the potential for the conflict to reach beyond internal (provincial) borders and maybe even international borders if Xinjiang were to further engage activists and/or separatist extremists in Central Asian territories. Uyghurs make up 8 million of Xinjiang’s 17 million inhabitants. 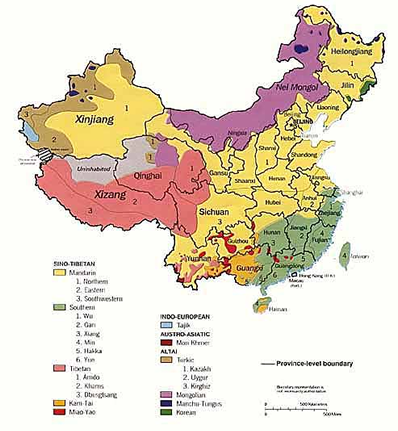 In 1949, Han Chinese made up 6.3% of Xinjiang’s population compared to 38% today (See map on Chinese language disbursement: In Xinjiang, the bright yellow represents Mandarin speakers (Han Chinese) and the tan represents speakers of Turkic languages (including Uyghur) (Lawrence). Not only has the composition of the population in Xinjiang changed but the quantity has changed as well. The oil reserves have produced an influx of people moving to the region for the wrong reasons. Many Han Chinese, who otherwise would not have gone (or subjected themselves to such an extreme climate) have either volunteered or were sent specifically to exploit the area’s natural resources. Not only does this deplete the resources themselves, it adds excessive pressure and strain on the local economy and the natural resources available for day to day living. (i.e. sacrificing agricultural land for urban development.) Therefore, to expound upon how this case was categorized earlier, it is not just the extraction of oil that is important but the unnecessary, extreme depletion of available resources and a loss of habitat (CIA World Factbook). The conflict exists between two ethnic groups within Chinese borders. As with most conflicts that happen internally in China, there is a great degree of conflicting information. Additionally, it is important to clarify that though the single incident in Yining (Gulja) has been highlighted, the overarching conflict between the ethnic Uyghurs and the Han Chinese spans many incidents of resistance and far more casualties. The conflict originated over the Uyghur people's desire for political and religious independence from the Han Chinese. With this desire for independence, came the struggle for natural resources and local economic sustainability. The exploitation of local oil reserves exacerbated ethnic differences and helped fuel the conflict. Specifically in regards to what happened in Yining in February of 1997, the numbers of casualties and deaths are estimates at best. Most reports (including Chinese officials’ numbers) range anywhere from nine to twenty dead and hundreds injured. Unofficial witness accounts have claimed anywhere from 30 to 100 to 400 were injured or killed (1). Other sources simply state that hundreds joined the demonstrations that day and when fighting broke out a ‘number of civilians and police officers were killed’. According to still other reports, prior estimates failed to take into account the number of those arrested and subsequently tortured in custody, or those who remain unaccounted for (Tyler, 167-172)(2). Following the incident, and as a direct result of it, Amnesty International asserts that 210 death sentences were subsequently handed down and at least 190 carried out. The level of the intrastate (civil) conflict is low. The small, localized, struggles were quickly and forcefully contained and put down by local Chinese enforcement. 11. Fatality Level of Dispute (military and civilian fatalities): Low, 30 civilian fatalities (reported). The core of the environmental conflict ultimately rests over China’s (or the Chinese government’s) access to oil in the Xinjiang region (the Direct environmental-conflict link). However, a second tier exists within the conflict over the ‘side-effects’ that the Uyghur population is now having to deal with as a result, not only with the decline in oil resources, but also the environmental degradation that has accompanied the influx of the population. Xinjiang is known for its agricultural land and appropriate climate for producing fruits, especially grapes, and other seasonal products. However, development (land development) has threatened the availability and richness of the land, somewhat paralyzing the region economically as they are unable to adequately compensate for lost sources of revenue. This growing scarcity of resources is an indirect environment-conflict link. The situation is ‘Sub-state’ in that the conflict over the strategic interests of oil are between two ethnic groups within China. Both the Chinese (Han) and Uyghur populations ultimately want control over the exploration and exploitation of the oil reserves located in Xinjiang. This same situation could also be viewed as a potential regional conflict because the surrounding Central Asian states not only may develop an interest in the oil (though oil suppliers are plentiful in the Middle East, Xinjiang, China does represent a geographically convenient location for importing oil to many of those countries and some have made agreements to allow China to come in and develope oil drilling sites for export back to China (ex: Kazakhstan)) parts of the populations in those Asian states such as Tajikistan, Kyrgyzstan and Kazahkstan have Uyghur populations as well and so there is a personal/ethnic tie or desire in seeing or supporting the development of an autonomous Uyghur state. Given that the outcome of the dispute is highly dependent upon one’s position within the conflict, this situation is even more complicated in that the description or categorization of this problem depends upon who you ask within the decision-making body (The Chinese government in this case) Some Chinese officials will say the situation in Xinjiang is under control or they will deny the severity (or existence) of the problem to begin with. However, other members within the party will hint at the greater complexity of the problem. They will acknowledge that ethnic clashes still continue and may even intensify due to the increasing importance of oil in the region and increasing awareness of the conflict both within China and internationally. The conflict has been categorized as a stalemate because though China insists it has controlled the situation, Uyghurs in the region would say the government has managed to suppress the disturbances but only temporarily and that in fact the underlying problems are still very real and very deep. The imposition of Chinese rule over the largely Muslim region continues to this day in all aspects of life for the Uyghur people. For example, just recently the government announced a plan to impose tougher birth control measures on the Uyghurs which Chinese officials claim will stem the population size which they say is beginning to cancel out the improvements attained through economic development (though most of the population in Xinjiang today is Han Chinese). However, the Uyghur people see this as just another example of excessive Chinese authority in the region which, in the past has led to vast human rights violations(1). This conflict in Western China is also quickly gaining worldwide attention as several Uyghurs who have been detained at the U.S. Guantanamo Bay prison for being possible enemy combatants in 2002 are petitioning to be released. The courts have ruled that the prisoners were detained illegally but the courts lack the power to release them (unable to overrule the President). More specifically related to the conflict at hand, the Uyghurs are seeking release and asylum in the US as they have stated that they will likely be persecuted if/when they return to China (2). These recent cases are evidence that the ethnic conflict between the Chinese government and the Uyghur population in Xinjiang is still very much alive. The environmental aspects of economic development continue to play an important role not only directly (as pertaining to oil resources) but also indirectly as population management becomes a more critical issue. (1) Bodeen, Christopher. More Birth Control Sought in China Region. The Washington Post online. February 17, 2006. (2) Leonnig, Carol D. Chinese Detainees’ Lawyers Will Take Case to High Court. The Washington Post. January 17, 2006. Separatism in Mindanao, Philippines Armed separatist movement began in the early 1970s. Islamic rebel groups engaged in armed conflict with government forces for independence. Tensions exist over the exploitation of the island’s resources and economic disparity. The Acehnese Resistance Movement and Exxon Mobil The resistance movement in the province Aceh began as a religious movement, but acquired a different tone once Mobil Oil Indonesia (MOI) began to exploit the oil and natural gas deposits there. The Biafran War After gaining independence from Nigeria, one of three ethnic groups in the region wanted individual independence. This was refused by the remaining groups because of the wealth of oil reserves at stake in the region and their desire to maintain access to them. Civil War in the Sudan: Resources or Religion? The civil war can not only be characterized as religious, ethnic and regional conflicts but economic as well. Deterioration of the ecological system and scarcity of resources is quickly intensifying the situation. KALIMAN After decades of ethnic and religious conflict in West Kalimantan, the problem has been further complicated by the government which has granted deforestation rights to cultivate palm oil contributing to the destruction of the rainforest and the local tribes’ way of life. Yadana Gas Pipeline in Burma The joint venture has drawn criticism from both inside and outside of Burma alleging that the deal was made with a government with massive human rights violations and a record of environmental degradation. Thai and Burmese Timber Trade The growing timber trade has left the peoples of the region to suffer under state sanctioned human rights abuses and the loss of vital environmental resources which their livelihood and tribal practices depend on. JAYAMINE Island of New Guinea, territory of Indonesia, people have suffered at the hands of the military over protests against copper mining operations. Opposition against Indonesia control has existed for several decades now as the indigenous peoples are racially and ethnically different from Indonesians. Spratly Islands Dispute Control of the Spratly Islands and the various natural resources available there, has been contended by China and several of its neighbors. With China searching for energy resources, it aims to impose its control over neighboring territories rich in oil, gas and other minerals. OGONIOIL The Ogonis, an ethnic group in the Delta region (Nigeria), have protested that Shell's oil production has not only devastated the local environment, but has destroyed the economic viability of the region for local farmers and producers. The Nigerian Federal Government has also been accused of failing to protect the environment harming protestors. Bodeen, Christopher. More Birth Control Sought in China Region. The Washington Post online. February 17, 2006. China-Iran Energy Talks Complicate Nuclear Standoff. The Wall Street Journal. February 17, 2006. Dillon, Michael, Xinjiang—China’s Muslim Far Northwest. Routledge Curzon, New York. 2004. Lawrence, Susan V. China: Where Beijing Fears Kosovo. 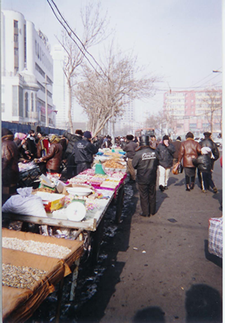 Xinjiang Issue, September 7, 2000 Far Eastern Economic Review. Leonnig, Carol D. Chinese Detainees’ Lawyers Will Take Case to High Court. The Washington Post. January 17, 2006. MacKinnon, Rebecca. CNN Correspondent. Does China have ethnic unity? Violence indicates 'no;' leaders say 'yes' April 4, 1997. Tyler, Christian. Wild West China. Rutgers University Press, New Jersey, 2004. Rudelson, Justin Jon. Oasis Identities. Columbia University Press, New York, 1997. Starr, Frederick. 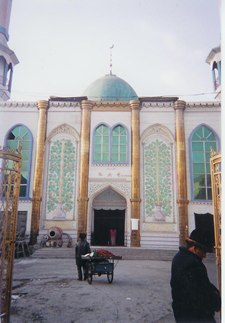 Xinjiang: China’s Muslim Borderland. M.E. Sharpe, New York, 2004. Human Rights Watch publication: Devastating Blows: Religious Repression of Uighurs in Xinjiang http://hrw.org/reports/2005/china0405/index.htm. New York, 2004. Xinhua General New Service. Xinjiang expected to be new relief for China’s energy resource supply. Urumqi, Xinjiang, China. June 1, 2004. Xinhua News Agency, China Exclusive: Oil/gas supply line being built along ancient Silk Road in NW China. Urumqi, Xinjiang, China. September 16, 2005. United Press International, Outside View: China’s Muslims Muazzam Gill. May 7, 2004.